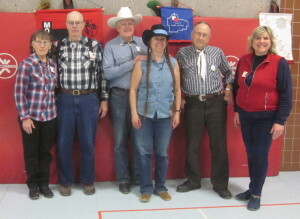 April 12, 2019 – County Line Squares “Western Roundup” Square Dance, Monticello, Caller Tom Allen, Cuer Sarah Klaphake. Dancers from Ar-Dale Dancers, Beaux & Belles, Cambridge Corners, Hot Foot Stompers, Single Circles, Spares & Pairs, Square & Twirl, Triple T, and Westonka Whirlers danced with County Line Squares. 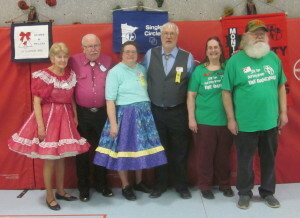 Spares & Pairs Queen Jennifer and King Barry, County Line Squares Queen Gael and King Doug, Federation at Large Patti and Jerry Ellingson, Square Dance Minnesota (SDM) Vice Chair Barry Downs, SDM Treasurer Gael Zachman, SDM Executive Director LeRoy Elfmann, SDM Historian Al Martin, SDM Marketing Director Dee Scott, RoundUp Advertising Manager Connie Walker-Pearson, RoundUp Subscription Manager and Enhancin’ Dancin’ Editor Paul Pearson, and RoundUp Spotlight Editor Patti Ellingson were present. Single Circles retrieved their banner. Cambridge Corners claimed a County Line Squares banner, and Hot Foot Stompers and Westonka Whirlers already have County Line Squares banners. Dancing to Caller Tom Allen.